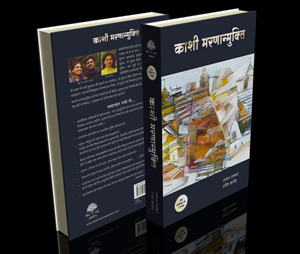 Kashi Mamanmukti, written by Manoj Thakkar and Rashmi Chhazed, is a spiritual novel that gives a penetrating vision of the splendid journey of its protagonist Maha, an executioner at the Ghats of Benares, towards enlightenment; a journey from Jeev (Being) to Shiva (Lord Shiva); a journey from limited individuality to the absolute union with God; a journey of the Supreme Awakening. The sacred teachings of the Shiva Purana and other Purana's (Indian Scriptures) contained within the pages of this spiritual treasure, revealed in a mystical story narrative form, encapsulate the real essence of Hindu Philosophy, and shows the Path to Salvation. From the tender age of thirteen Mahamrinangam (Maha) makes the burning of funeral pyres as an executioner at the Manikarnika, the great cremation ground of Kashi (Varanasi), his practicing of austerities. Staying in Kashi reveals upon Maha the mysteries of the five elements, while Kabir and Tulsidas, the mystic and the great poet, engulfing his dreams and thoughts elucidate the manifest and unmanifest paths to God. But in a moment of great ignorance, and under the influence of Maya, Maha decides to leave Kashi. The journey that thence unfolds takes him to the zenith of that spiritual practice where everything is non-dual, and where this dweller of the crematory attains oneness with Lord Shiva, the KashiVishwanath — Kashi's Lord of the Universe, sovereign of the great crematorium. It is a peaceful mind and not the disciplined one that can understand the true meaning of creation because creation is possible only in a state of absolute freedom, and freedom is the birth child of peace. God has been creating and destroying infinite things through infinite years together, and it is an art. Thus, to understand God in terms of infinity one will have to create a minute part of its infinity as God only, and this book is nothing but a very minute part of that infinite blessing where Thou descended for a few moments in that absolute freedom of a peaceful mind, and where the author, the book and the process of writing became One.